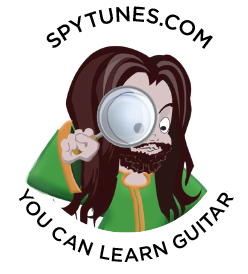 Larrivee is Spy Tunes favourite acoustic guitar brand! Jean Larrivee studied classical guitar but soon turned to building them instead after meeting Edgar Monch (German Luthier) in his early twenties. Jean became Edgar’s apprentice and built a few classical guitars in his workshop before moving on to continue his passion from his home in Toronto, Canada. After some years in the workshop, Jean built his first steel string acoustic in 1971, catering for the thriving folk scene in Toronto. In the model L-09, you can clearly see the classical guitar influence. 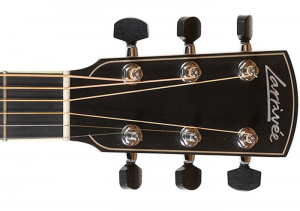 This has proved to be one of Larrivee’s most popular model. This is the guitar used when recording the exercises and almost all Spy Tunes acoustic songs. I bought my L-09 new from a shop in Stockholm in the late 90s, it has since then travelled everywhere with me, being my only acoustic guitar since. The L-09 is not your average steel-string. The body shape, the bracing and the neck have their own unique twist with a strong classical influence. I fitted mine with a Sunrise pickup and a customized B-Band setup, making this a triple source pickup system. When fitting this system the pickup market had just started to properly expand. Dual source preamp units had just come into place from more manufacturers than just Rane and Pendulum Audio who for years had been completely on their own in this field. I took this one step further by blending the under saddle transducer with a condenser on the actual guitar. Using a stereo cable this is then fed into a stereo preamp where the sunrise would run on the tip, the B-Band dual source on the ring. A few years ago, jumbo frets were also fitted making the L-09 difficult to play but resonating even better. These days you can get pickup systems like ‘The Aura’ or the ‘L.R Baggs Imix’ straight from the factory. This makes Larrivee a highly competitive choice among giants like Taylor and Martin. Larrivee might be known to most people for their cutaway and full on inlay designs. The Florentine is the extreme cutaway first used, a sharp design that really made Larrivee stand out. The later development of the Venetian cutaway with its softer shape has since then become a more popular choice and is today offered on many models. The full-on inlays that you might have seen on headstocks are mostly done by Jean’s wife Wendy Larrivee. Ironically the first Larrivee guitars didn’t have any inlays at all, not even any dots! So it seems Wendy not only completed Jean’s private life but also his guitars.